Fully accessible online, accessible through a web browser, no downloads or installation necessary! BEGINNER LEVEL: WHAT PLANTS NEED! Case Study 1: Solving the Energy Crisis: A Plant is an amazing plant! Case Study 3: Feel the Burn! We are highly adaptive social animals who live to "play" and our discoveries are limited only by our own imagination. As we all arrive, develop, and learn in a bright, noisy, interactive world, our brains are wired to explore, question, and solve within that context. Educational tools should be designed around the way our brains learn. "...The success of complex video games demonstrates games can teach higher order Thinking skills such as strategic thinking, interpretative analysis, problem solving, plan formulation and execution, and adaptation to rapid change. These are the skills U.S. employers increasingly seek in workers and new workforce entrants..."
"...The data analysis found classes using the game had significantly higher means than those classes that did not use the game. There were no significant differences between male or female scores, regardless of game play, while both genders scored significantly higher with game play than without. There were no significant differences between ethnic groups, while all ethnic groups scored significantly higher with game play." "In this paper, I argue that video games are such a popular and influential medium for a combination of many factors. Primarily, however, video games elicit powerful emotional reactions in their players, such as fear, power, aggression, wonder, or joy. Video game designers create these emotions by a balancing a number of game components, such as character traits, game rewards, obstacles, game narrative, competition with other humans, and opportunities for collaboration with other players. Understanding the dynamics behind these design considerations might be useful for instructional technologists who design interactive digital learning environments. Further, video game playing occurs in rich socio-cultural contexts, bringing friends and family together, serving as an outlet for adolescents, and providing the "raw material" for youth culture. Finally, video game research reveals many patterns in how humans interact with technology that become increasingly important to instructional technologists as they become designers of digital environments. Through studying video games, instructional technologists can better understand the impact of technology on individuals and communities, how to support digital environments by situating them in rich social contexts." Your old login information should allow you to log in to the current Spongelab Biology platform. If you wish to register a new account on the current Spongelab Biology platform, you can do so here. 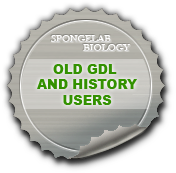 The old Spongelab Biology platform has been discontinued, but administrative reports can still be accessed here.